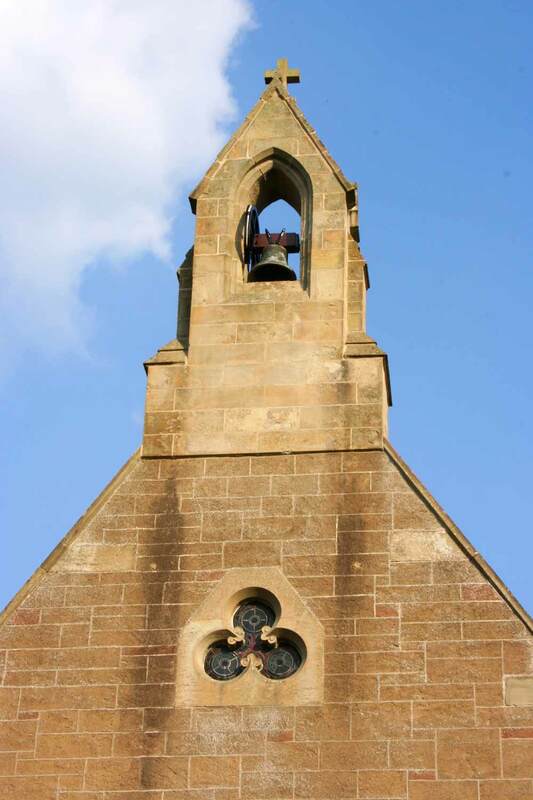 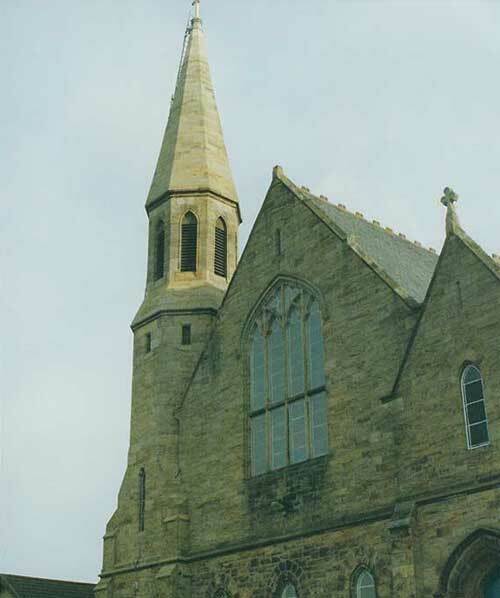 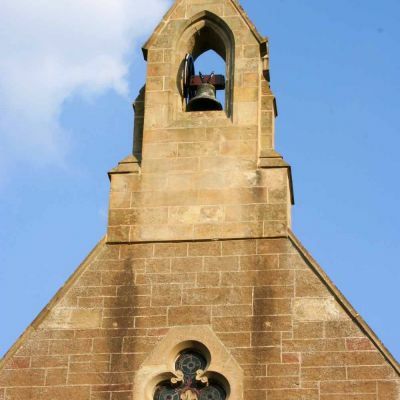 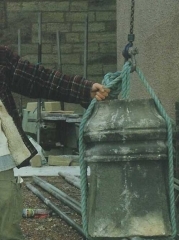 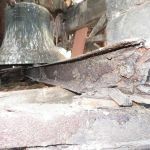 During the freak storms of January 2001, Gorebridge Parish Church in Midlothian suffered the unusual fate, and disastrous consequences, of having the finial and the top 5 feet of its spire blow off, crash down through the roof, and land in the upper gallery of the main church building where it smashed 2 pews and the floor. 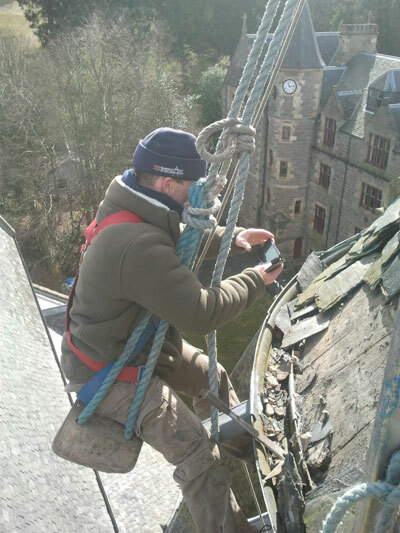 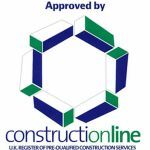 BCM Steeplejacks were called in to deal with the emergency. 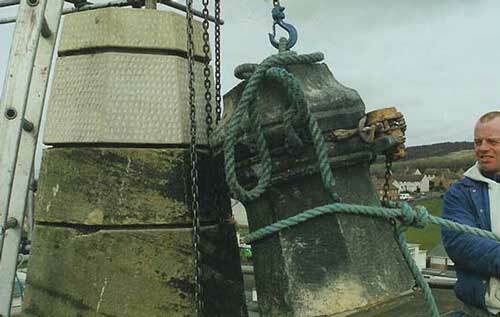 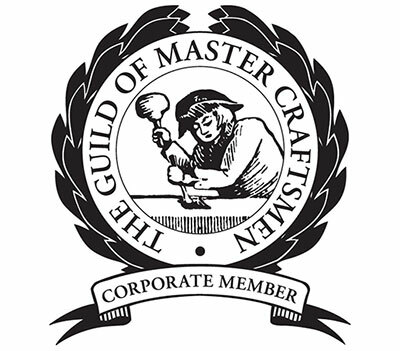 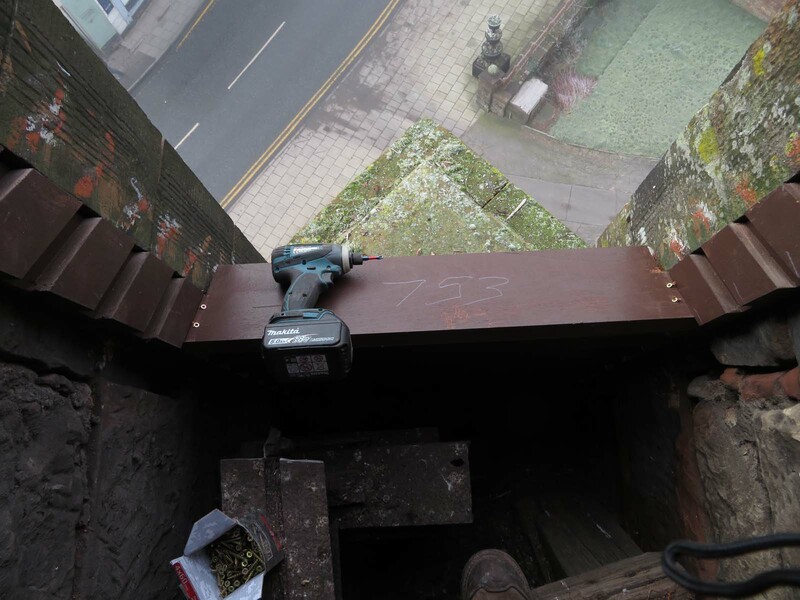 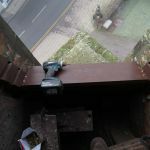 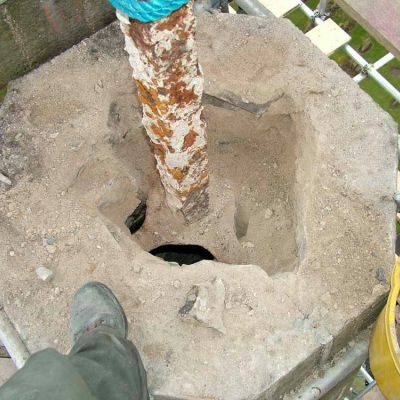 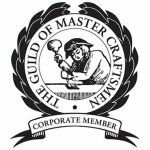 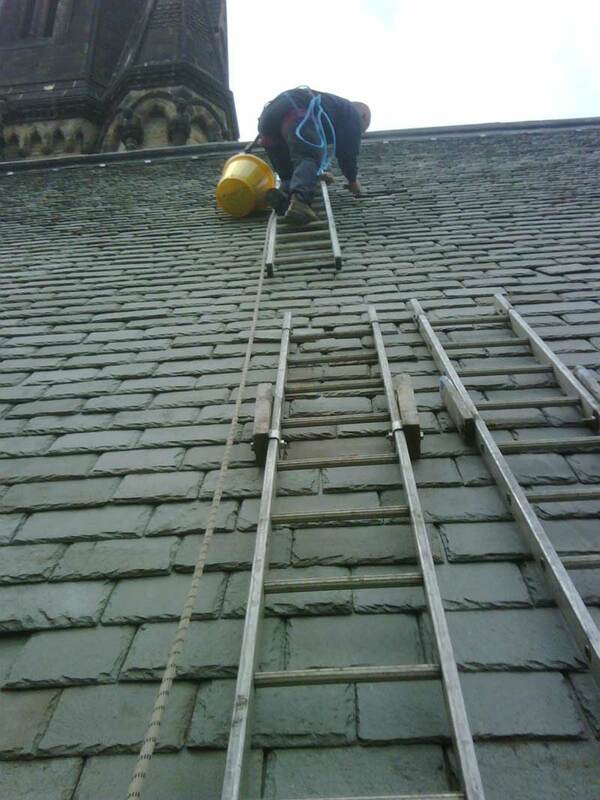 The first task was to check that there was no further danger of masonry falling from the spire. 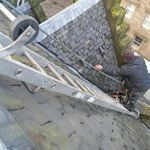 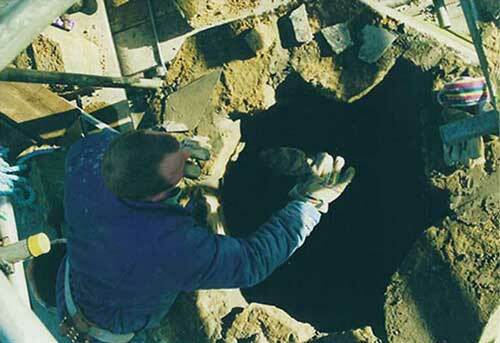 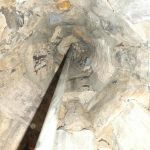 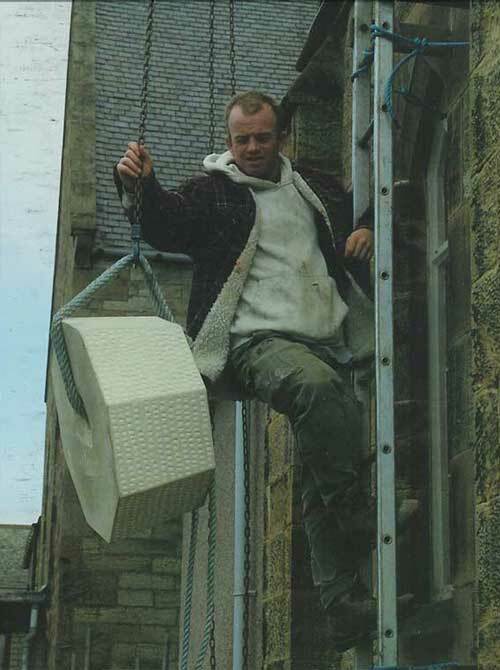 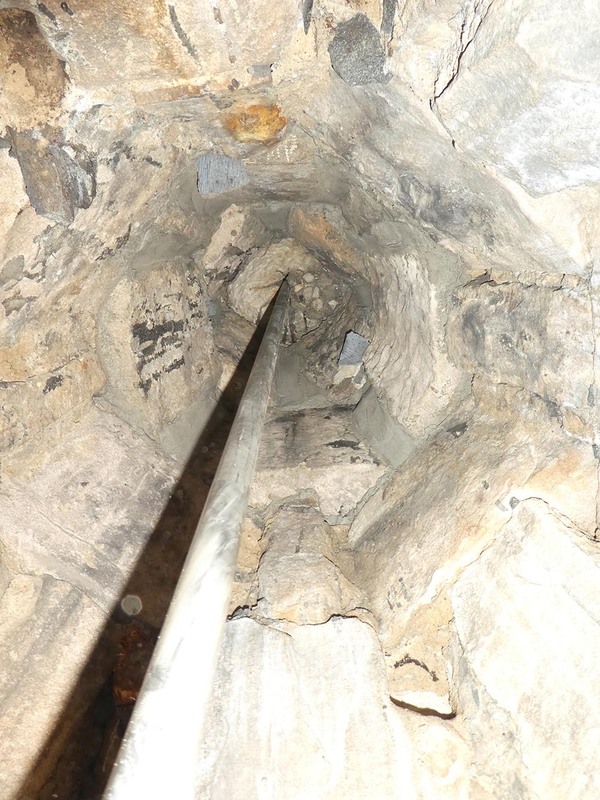 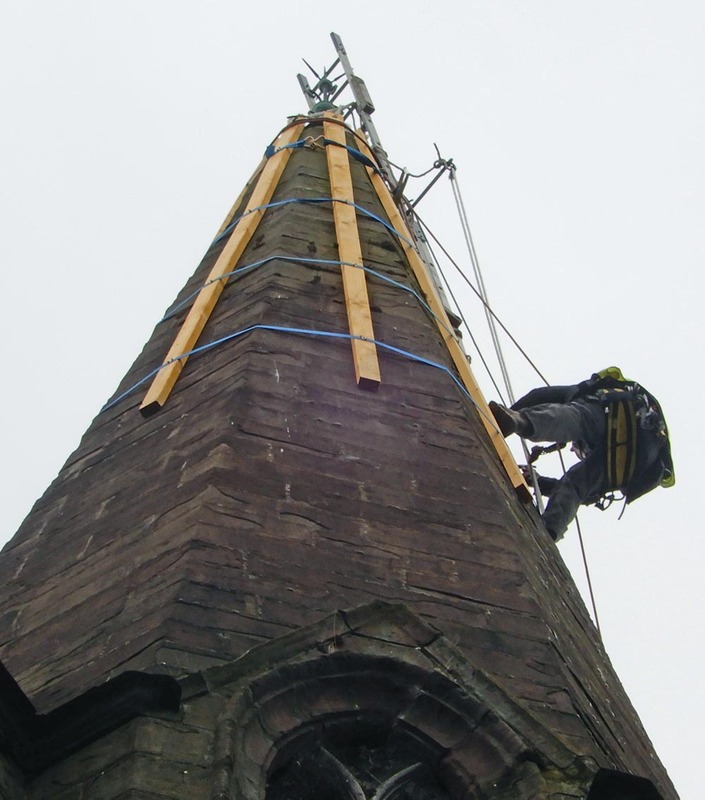 We then happed over the hole in the roof to keep out the storm, and proceeded to put our access in place to carry out the necessary repairs to the spire. 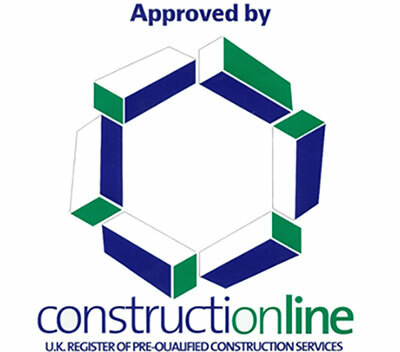 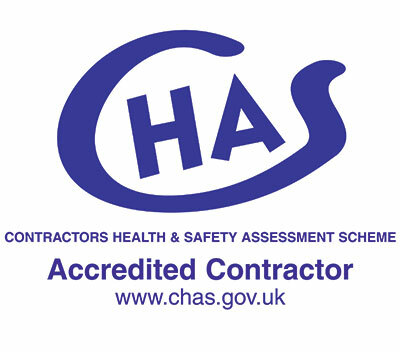 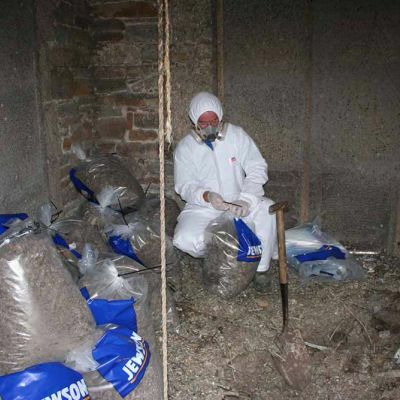 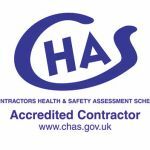 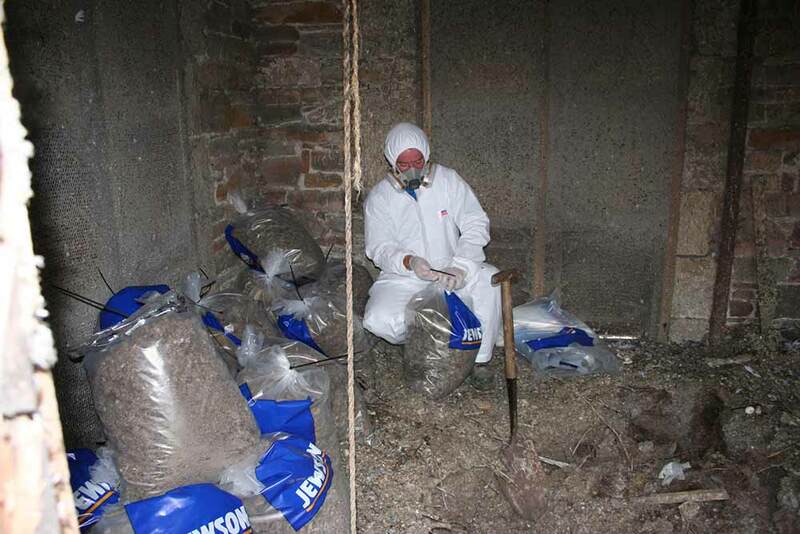 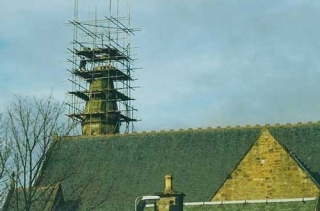 After this phase had been completed we were asked to carry out the repairs to the roof. 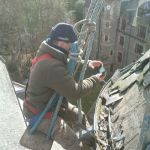 Below is a quick overview of the whole contract. 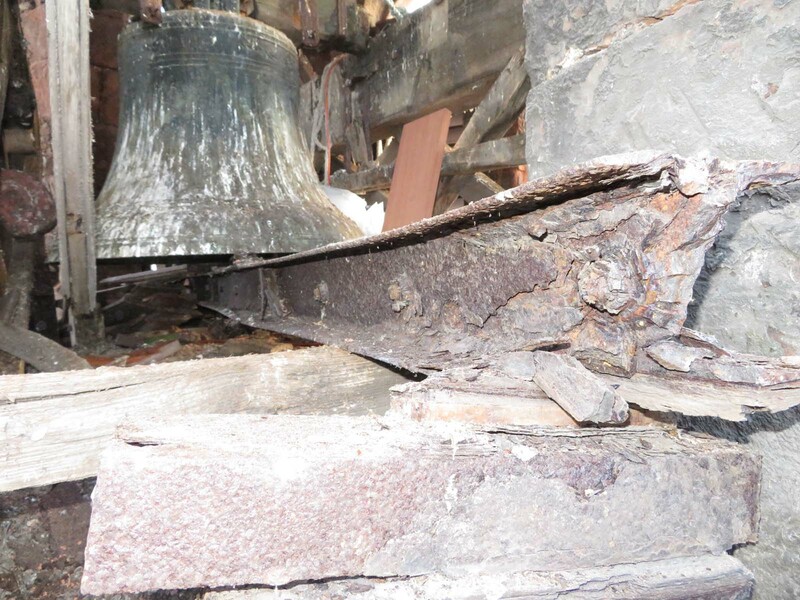 Unfortunately we do not have any pictures to show how the spire looked immediately after the accident. 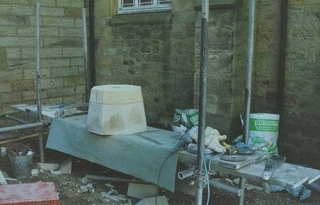 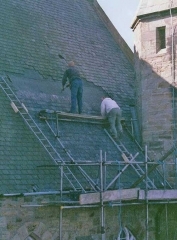 We were too busy getting the scaffold on and dismantling the damaged masonry to think of taking pictures. 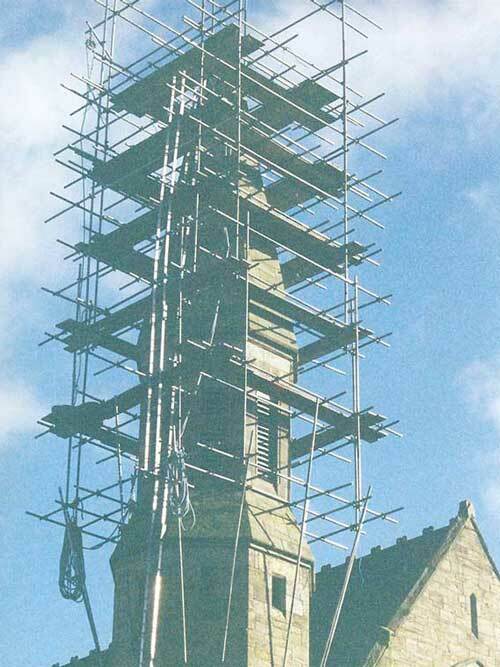 Scaffold on and ready to start dismantling. 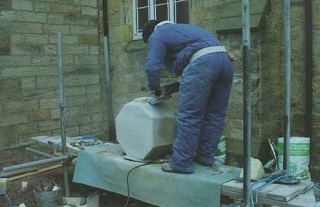 This was the first stone to be removed. 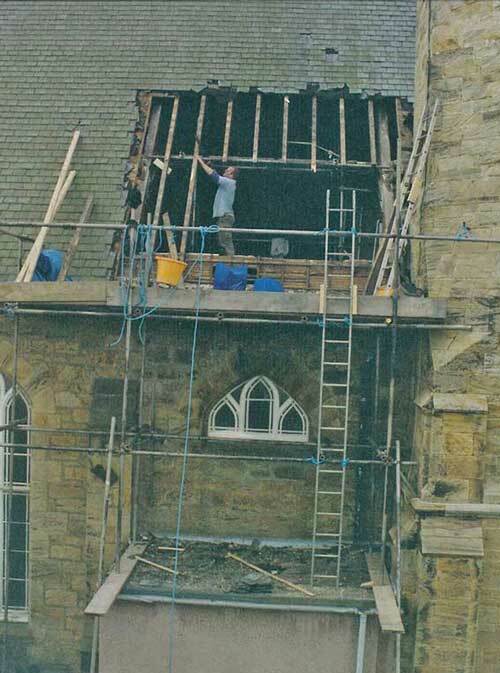 Everything above this level had fallen through the church roof. 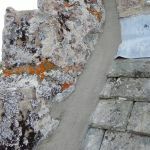 Down to solid masonry, and ready to start the rebuild. 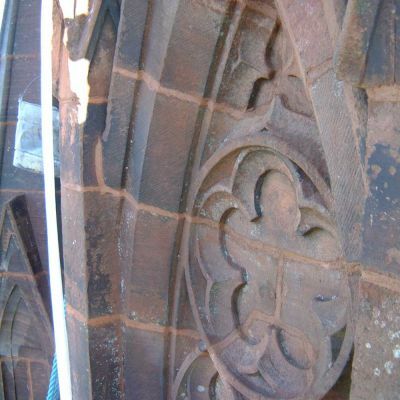 Two of the stones were smashed beyond repair in the fall, and had to be replaced. 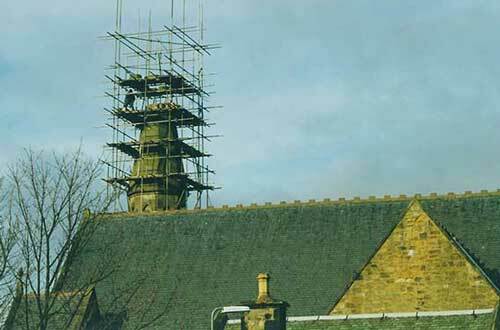 This is the bigger of the two nearing completion. The two stones complete and ready for building. 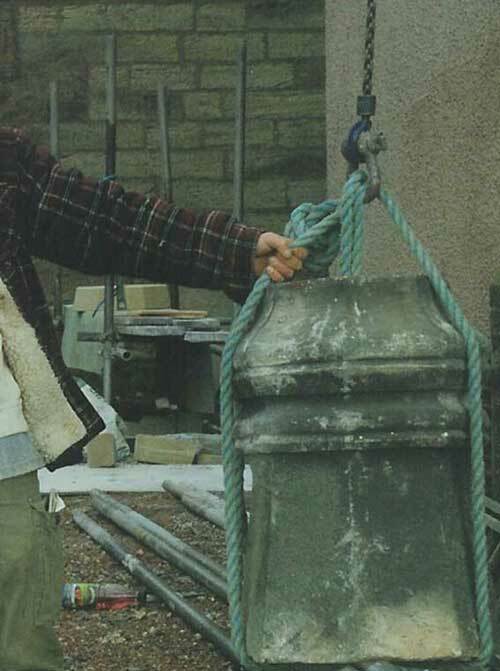 Hoisting one of the new stones. This was the only stone that survived the fall intact. 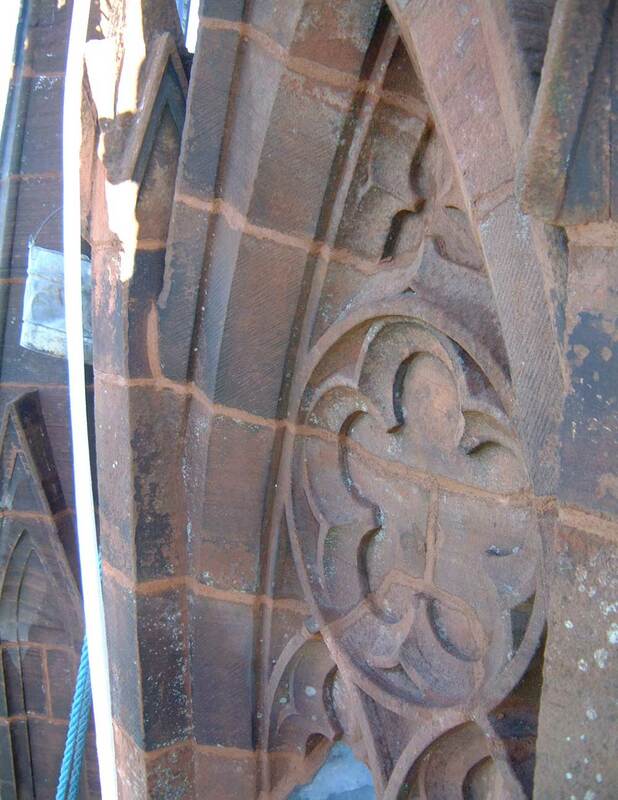 Before rebuilding it we drilled and dowelled through it at multiple points, in case it had been weakened. 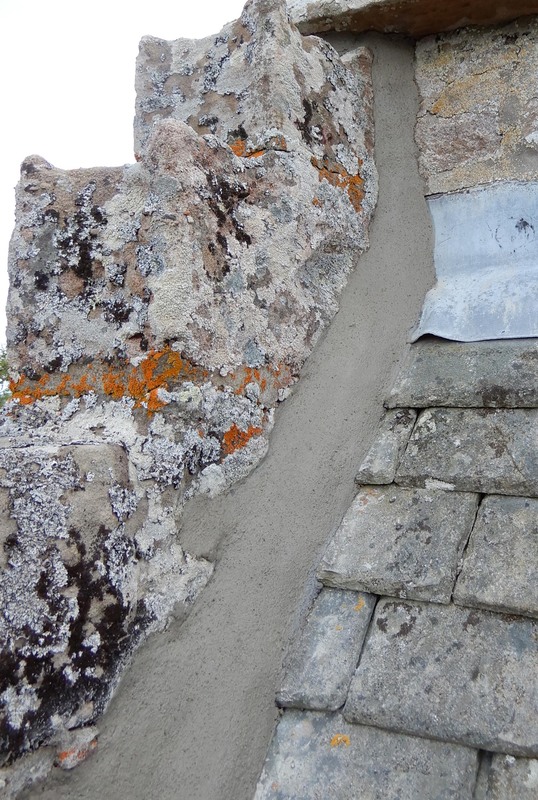 The two new stones now built. Lifting the crown stone into position. 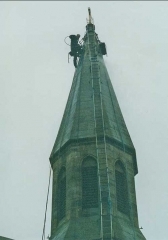 Waterwashing the spire after the building phase. 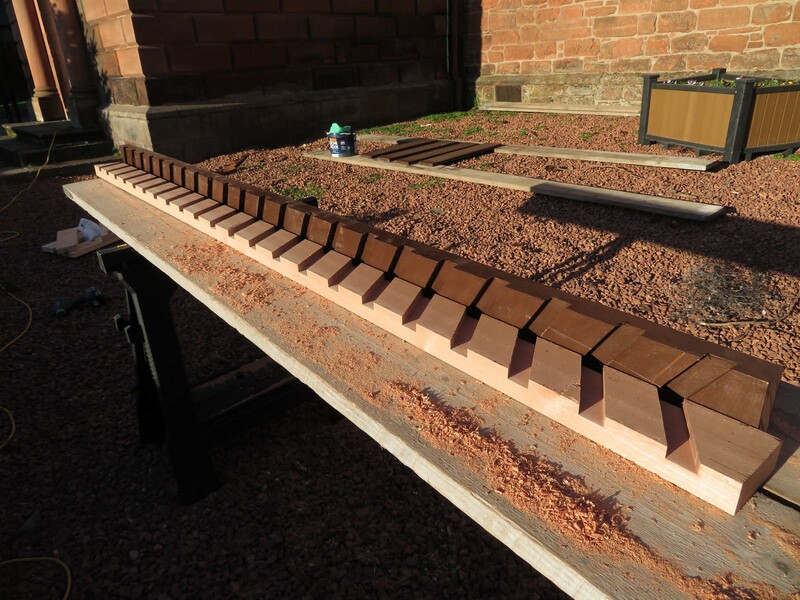 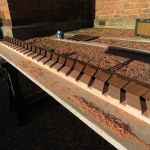 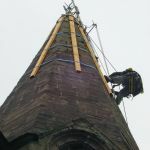 Although the new stone matched the underlying true colour of the existing masonry, the external surfaces of the spire had become much darker over the years so we had to clean the spire to tone down the difference in colour. 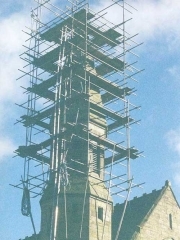 Work on the spire completed. 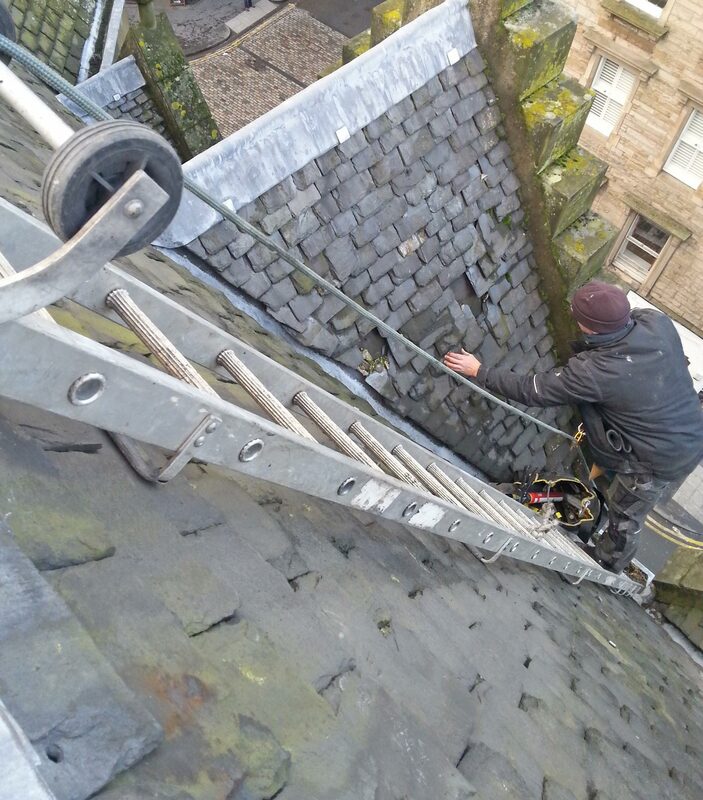 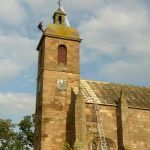 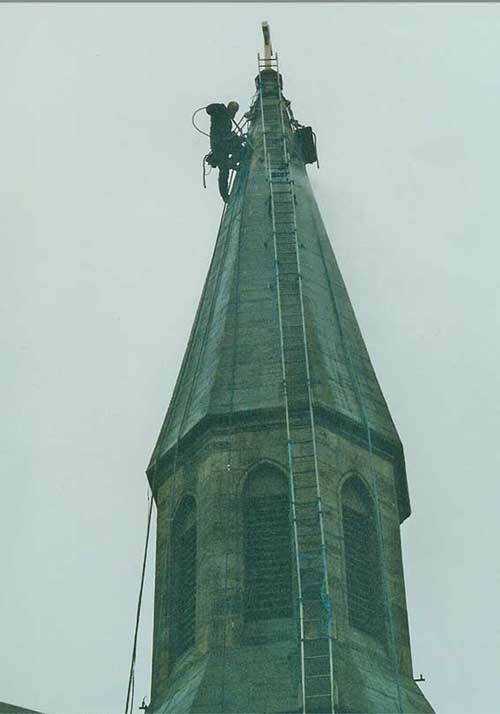 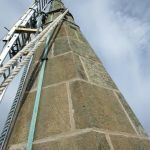 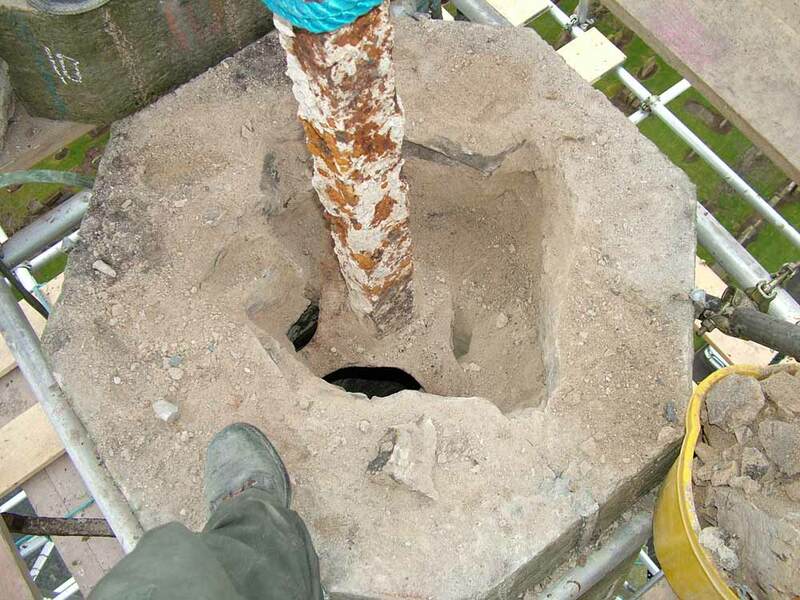 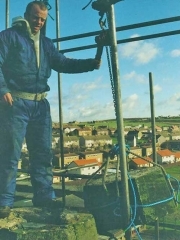 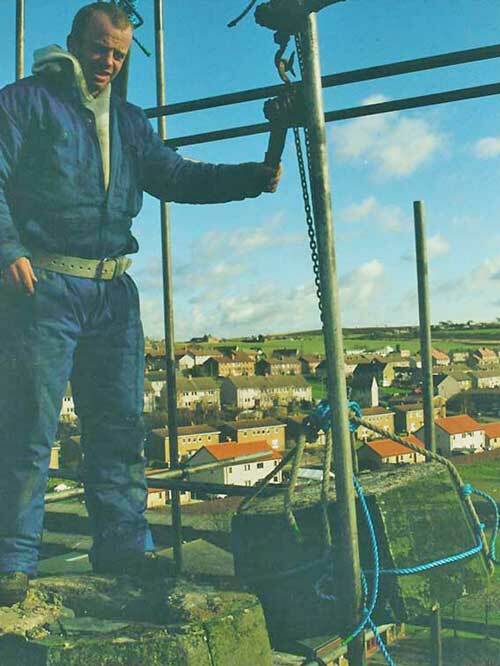 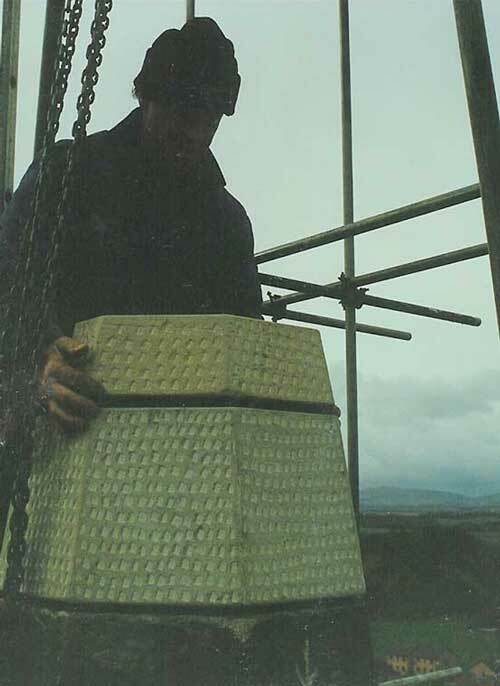 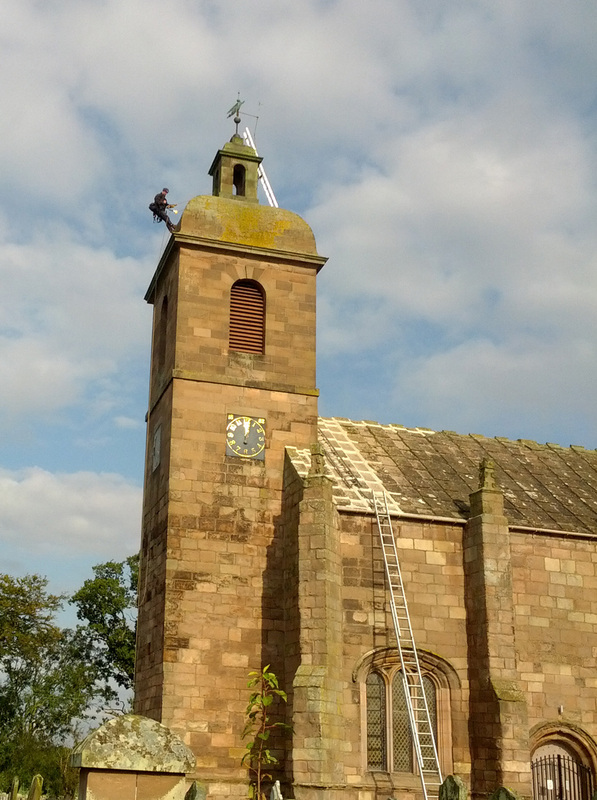 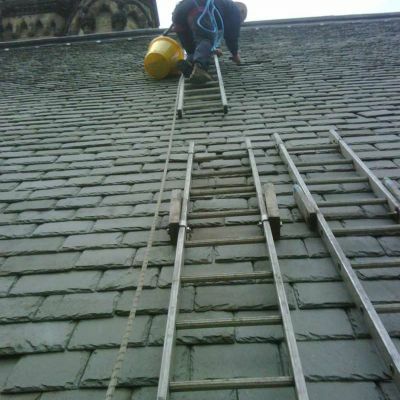 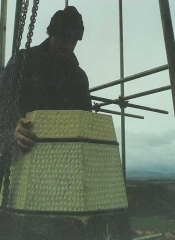 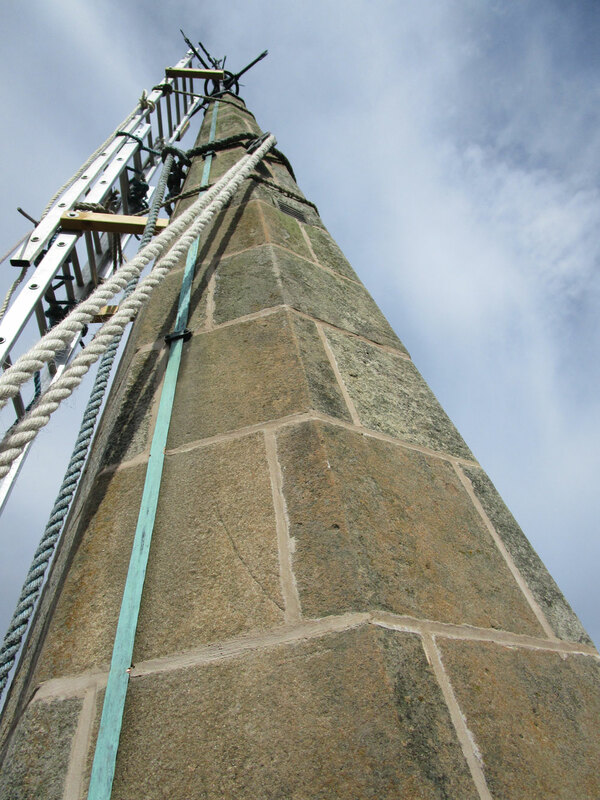 Once work to the spire had been completed we were able to make a start on the roof repair. 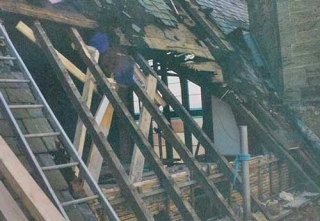 Although we have stripped away some of the smashed boards, you can still see the impact area on the right of the shot. 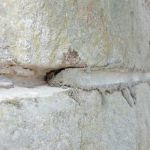 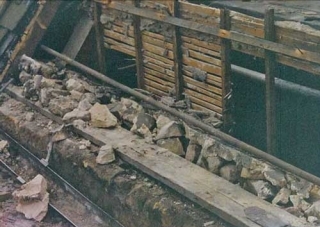 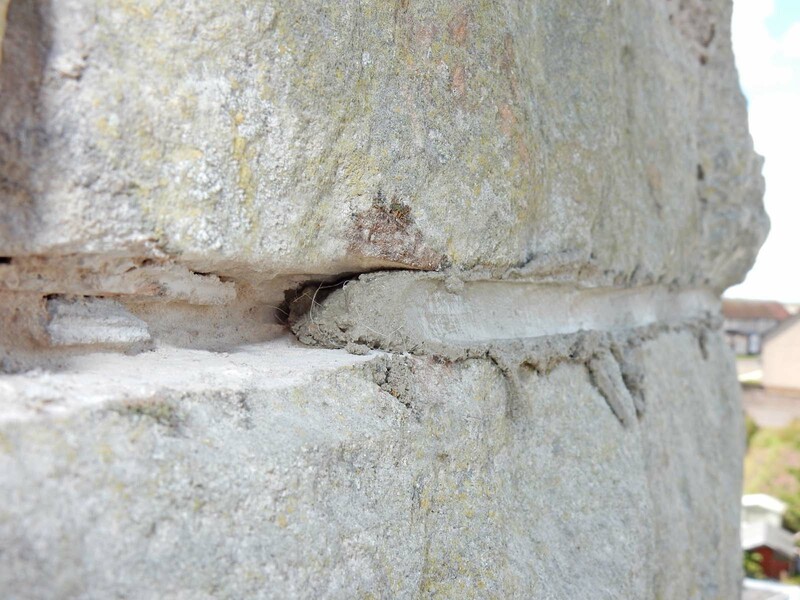 The condition of the smashed wall head before repairs began. The wall head repaired. 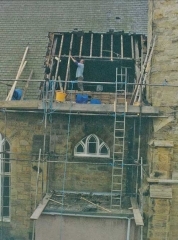 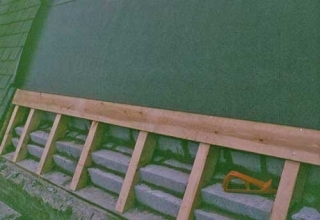 The new joists, sarking, and felt can also be seen.